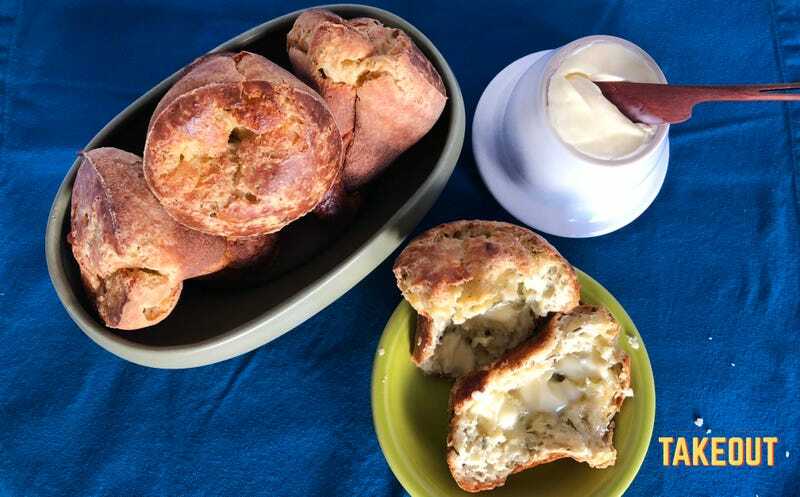 Popovers are an essential recipe to have in your back pocket. They’re easy to throw together using basic pantry staples, and impressive when they come to the table. They’re versatile enough to go with breakfast, lunch or dinner, and can even be made ahead and reheated. They can be as casual as a basic carb next to your salad lunch, or as fancy as you need for the bread basket at Sunday roast. They are delicious simply anointed with butter or jam, but can also stand up to stronger flavors, so they are great pals with punchy compound butters or any variety of flavored cream cheese. Neiman Marcus is famous for serving giant popovers the size of clinchers at their in-store cafes, where they come to the table right out of the oven and with a little swirled pat of strawberry butter. There is probably scientific evidence that the consumption of a hot popover with strawberry butter leads directly to larger in-store purchases. Your everyday popover is nothing to shake a stick at, but if you’re feeling adventurous, why not try turning up the volume a bit? Ranch is a great flavoring for popovers. First off, the mix is a powder, so it doesn’t mess with the liquid ratio of your batter. You can enhance the ranchiness with the addition of fresh herbs. Still great with just a slick of butter, but now also a strong partner for soups and chilis of all sorts, and they cry out to be filled with pulled pork or barbecued chicken. A celebration of ranch, the most American of sauces, these will inspire you to get your popover on with far more frequency. Whisk your eggs in a large bowl. Add in the milk and whisk to mix, then add the slightly cooled butter until well-combined. In a separate bowl, mix flour, ranch powder, black pepper, and once combined, stir in the chopped herbs. Whisk about two-thirds of the milk-egg mixture into the flour, beating well until no lumps remain, then whisk in the remaining liquid. Transfer the batter to a large measuring cup or a large pitcher with a pouring spout, and cover with plastic wrap, pressing the plastic down onto the surface of the batter. Let rest at room temperature for at least an hour. If you are going to bake within four hours it’s fine to leave the batter out, otherwise it can be refrigerated for up to 24 hours. If you do refrigerate it, be sure your batter returns to room temperature before you bake. Whisk the rested room-temperature batter vigorously to make sure it’s fully combined, then pour into prepared popover pan, filling each cup to about 1/2 inch from the top. Don’t overfill, you might have a small amount of batter left over. Bake without opening the oven door until fairly “popped” and just beginning to brown, 20-25 minutes—but start checking at 15 minutes. Decrease the oven temperature to 300 degrees (again without opening oven door), and continue to bake until popovers are golden brown all over, about 35 to 40 minutes more. Open the oven door, and using a small skewer or the tip of a paring knife, poke small hole at the top of each popover and turn the pan if they are not coloring evenly. Close the door and continue to bake until deep golden brown, about 5-10 minutes longer. Remove from the oven and rest the popover pan on a wire rack. Poke each popover again with your skewer or knife and let cool for a few minutes. Turn out popovers. Serve hot with the spread or filling of your choice. These are fine to make ahead a day or two. To reheat, place the popovers on a wire rack over a baking sheet and bake in a preheated 400-degree oven for 6-8 minutes until hot and re-crisped. Sensitive Pee Baby Yadier Molina Didn&apos;t Like Kris Bryant Calling St. Louis "Boring"